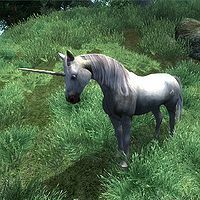 The Unicorn is the focus of Hircine's Daedric shrine quest, in which you are asked to kill the unicorn and return its horn to Hircine. It is found in Harcane Grove protected by three Minotaurs of the Grove. The unicorn is present from the beginning of the game, even if you have not started Hircine's quest. The unicorn can be ridden like a regular horse and used as a free mount. The unicorn is equivalent to a white horse in speed, has a very powerful attack, is resistant to several types of attack, and reflects damage. However, it will attack almost anyone or anything wielding a weapon (including fists) and will not stop attacking until its target is dead. This means that the unicorn will attack monsters, enemies, allies, and even you, in most cases. Accidentally pulling out a weapon at any time, or raising your fists, even to defend the unicorn, will lead to you being attacked. However, the unicorn may not attack you if its disposition is sufficiently high, for example, if you have high fame. The unicorn does not react to destruction or conjuration magic, so it may be a more suitable mount if you focus on these skills (the unicorn will not attack conjured creatures, but it will attack Everscamps). Hircine: You must make an offering of a bear or wolf pelt... and the horn of a Unicorn. If you do not want the unicorn as your horse, do not mount it. The minute you mount it, the unicorn will replace your old horse; every time you fast travel the unicorn will be used as your mount. You should not ride the unicorn when you have followers, because if they draw their weapon to fight enemies, the unicorn will become hostile. The unicorn does not count toward your "Horses Owned" statistic. You cannot purchase horse armor for the unicorn. When you are not riding the unicorn, it will return to the grove. This page was last modified on 6 April 2018, at 19:16.